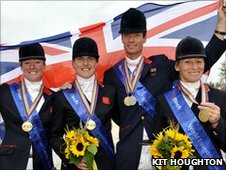 Sussex eventer Tina Cook has praised her team-mates after winning a team gold medal at the World Equestrian Games in Kentucky. The 40-year-old from Findon rode Miners Frolic at the competition. Cook said: "It's fabulous. We knew we had a strong team - fantastic riders and horses - but you always need a bit of luck on your side. "The pressure was on right to the end and my team-mates came up with good clear rounds." She added: "It's what we've been building up to all year." Cook had eight faults in her round, but clear rounds from Nicola Wilson, Mary King and William Fox-Pitt saw Britain win ahead of Canada and New Zealand. "This time it didn't go for me but that's what team competition is about, it's all team performances put together," she said. Cook is now turning her attentions to the London 2012 Olympic Games, but will consider her options before deciding what to do with her horses. "It's pretty obvious that most riders will be aiming for the Olympics and want to have their horses there in the best condition possible and not over-run them," she said. "Horses only have a certain amount of competitions at this level in them and you want to have them fit and well for London. "I've got to get it right that I and my horse are in form and fit and healthy for London. "That's where the skill is going to be from now on - deciding where we go from here."